Laura Silsby, shown in an earlier photo, told CNN Thursday that she didn't mislead others in her group. 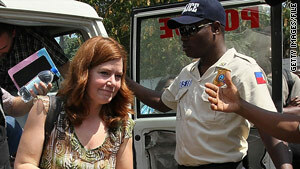 Port-au-Prince, Haiti (CNN) -- Two Americans charged with kidnapping in Haiti appeared before a judge Thursday, a day after the judge released eight other Americans on bail and allowed them to return home. All 10 were charged with trying to take 33 children out of Haiti after a magnitude-7.0 earthquake devastated the impoverished country on January 12. The Haitian judge ruled Wednesday that Laura Silsby and Charisa Coulter would remain behind because authorities want to determine why they traveled to Haiti on an earlier trip, before the January 12 earthquake, said Silsby's attorney, Avion Fleurant. Fleurant said Judge Bernard Saint-Vil was unable to ask questions of Silsby and Coulter on Thursday because a translator had not arrived. The judge also said he wanted to see the place in the Dominican Republic where the group was supposedly headed when it was stopped at the border, the attorney said. On their arrival at court, however, Silsby told CNN that it was "not true" that she had misled the other missionaries in her group. She also said that "we brought food and clothes and toys to the children" at an orphanage on their December trip to Haiti. Video: Missionaries back in U.S.
Video: 8 missionaries back in U.S.
On her way out of the courtroom and back to her cell, Silsby said the proceedings "went very well." "We're trusting God for all truth to be revealed and believing that God will reveal the truth through the Haitian justice system," she said. "They are seeking the truth." Haitian authorities stopped the group on January 29 as they tried to cross the border with 33 children. The Americans said they were going to house the children in a converted hotel in the Dominican Republic and later move them to an orphanage they were building there. Some of the detained Americans said they thought they were helping orphans, but their interpreters told CNN earlier this month that they were present when group members spoke with some of the children's parents. Some parents in a village outside Port-au-Prince said they had willingly given their children over to the Americans, who promised them a better life, and who said the parents could see their children whenever they wanted to. The eight other missionaries left Haiti on Wednesday night after being granted bail without bond, akin to being released on their own recognizance in the American justice system. They arrived in Florida late Wednesday night and most -- including a Topeka, Kansas, firefighter and an Amarillo, Texas, builder -- were returning to their hometowns Thursday. Jim Allen told a group of friends and neighbors in Amarillo that he was "glad to be home." "The reason I went was for the relief effort to help these people," a tearful Allen said. "And they still need your help. I hope that that can continue." Another group from Boise, Idaho, arrived home early Friday. CNN's John Vause and Dan Simon contributed to this report.